Lua error in Module:Location_map at line 488: Unable to find the specified location map definition: "Module:Location map/data/USA West" does not exist. 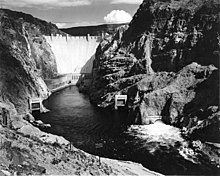 The Hoover Dam is a large dam on the Colorado River. It is on the border of the states of Arizona and Nevada. The reservoir it made is called Lake Meade. The dam is named after the former US President Herbert Hoover. At first it was called "Boulder Dam", but the name was changed to honor Hoover, who was president when the idea of building the dam started. 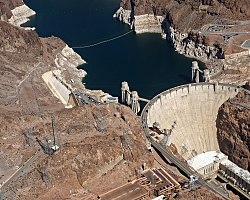 ↑ "Frequently Asked Questions: Lake Mead". Bureau of Reclamation. Archived from the original on 2012-06-03. Retrieved 2010-07-02. ↑ "Frequently Asked Questions: Hydropower". Bureau of Reclamation. Archived from the original on 2010-03-23. Retrieved 2017-02-22. ↑ "Hoover Dam". National Historic Landmark summary listing. National Park Service. Archived from the original on 2010-07-16. Retrieved 2010-07-04. This page was last changed on 6 February 2019, at 20:40.